New Paltz, New York is located about 80 miles north of New York City and is part of the Catskill Mountains known as the "Shawangunks" (see map). Bordered to the east by the Hudson River we are in the apple-growing region of the historic Mid-Hudson Valley. 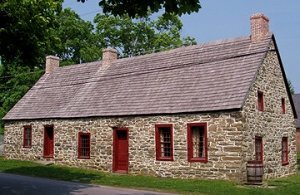 New Paltz began as an almost 40,000 acre settlement, after being sold by the Esopus Indians to a group of twelve Huguenots in 1677. Today, Huguenot Street, the originial home of the twelve settling Huguenot families, is a historic site. It is located on the west side of town on the Wallkill River. Huguenot Street has been designated a national landmark and tours are conducted regularly. The houses date from 1705 to 1890 and are open to the public for tours. Included in the tours are 6 stone houses, a French Church and burying ground, library, museum, gift shop and picnic grounds. The Town of New Paltz surrounds the Village. The town government is headed by the Supervisor and a Town Council. It is a separate government from the Village. This site will guide you through the community with links like "Recreation", "Organizations", "Worship", "Government", "Food", "Lodging", "Business", "History", "Scenes", "Getting Around", and more...including links to local newspapers. The official village web sites offers information on Osa Cho - Our Sister City, Village Events, Board Meeting Minutes, Maps of the Village, Village Government, History of New Paltz, Planning Board Agenda, and other village information.